1. In a juicer, juice pomegranate, sugar and milk. 3. Sprinkle few pomegranate seeds just before serving. 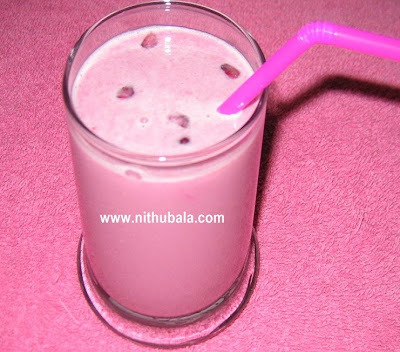 Very catchy and refreshing shake,glad to see u back after a long Nithu..
Love that Color!!!!! Very Refreshing!!!! Very colorful and healthy shake. That's such a lovely and refreshing smoothie. I have never tried smoothies with pomegranate- now I know better! Refreshing Pomegranate drink...thanx for visiting me...You have a lovely space with a wonderful collection of recipes...Glad to follow you tooo.. Healthy & colourful refreshing drink!!! Refreshing and healthy drink. I'm visiting your blog after a long time looks great Nithu. healthy n yummy shake! nice click~! Looks refreshing. what hpd r u doing good? long time any good news. take care. Looks so yummy.. healthy drink.. I think i have missed so many posts.. Awesome, i love pomegranate and this sounds delish!!! Nice colour and healthy drink. Love anaar juice, I am sure the shake was as lovely as the color!